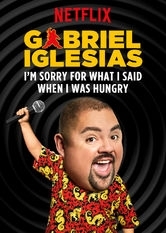 Gabriel Iglesias: I’m Sorry for What I Said When I Was Hungry (2016) – What's New on Netflix Canada Today! Hawaiian-shirt enthusiast Gabriel “Fluffy” Iglesias finds the laughs in racist gift baskets, Prius-driving cops and all-female taco trucks. Hawaiian-shirt enthusiast Gabriel “Fluffy” Iglesias finds the laughs in racist gift baskets, Prius-driving cops and all-female taco trucks. He’s survived a death hoax, meeting Schwarzenegger, and drinking an entire chocolate cake shake. He has no regrets. Hawaiian – shirt enthusiast Gabriel "Fluffy" Iglesias finds laughs in racist gift baskets, Prius – driving cops and all – female taco trucks.